Controlled space closure in cases of isolated lower second premolar aplasia (ILSPA) without maxillary counterbalancing extraction is challenging. Anterior anchorage loss may occur during space closure resulting in compromised occlusal results in terms of an absence of proper canine guidance during laterotrusive mandible movements. In order to evaluate the effectiveness of Herbst telescope anchorage in combination with double-cable, pull mechanics and a completely customized lingual appliance for orthodontic space management in cases of ILSPA, we tested the null hypothesis that there is a significant deterioration in the sagittal canine relationship towards an Angle-Class-II occlusion expressed as a loss of anterior anchorage following space closure with molar mesialization. Twenty-five consecutively de-bonded subjects (female / male 17 / 8; aged at T0 (start of MB Tx) 12.3 to 20.6 years; mean age 15.0 / SD 1.7 years) were included in this retrospective analysis using the inclusion criteria of least of one lower second premolar aplasia; completed treatment with a totally customized lingual appliance (CCLA) in combination with Herbst telescopes. Exclusion criteria were the absence of counterbalancing maxillary extractions, as well as additional tooth aplasia other than lower second premolars. A total of 33 single, lower premolar aplasia space closures (right / left sided 17 / 16) were assessed using plaster casts and intra-oral photographs scaled to the plaster casts, at bonding (T0), Herbst insertion (T1), following gap closure (T2) and de-bonding (T3). Parallelism of roots was controlled by panoramic x-rays at T3. The mean aplasia space at T0 was 7.5 mm (SD 2.6). Complete space closure was achieved in all 33 situations. The null hypothesis was rejected. There was a significant improvement in the initial canine relationships (mean 3.5 mm distal occlusion at T0) to a mean 0.1 mm at T3. When evaluated against the individual treatment plan, the following amounts of planned improvements were achieved: space closure 100%, canine relationship 97.5%, overjet 93.9%, overbite 96.4%, parallel roots in space closure site 93.9%. Herbst telescope anchorage in combination with double-cable pull mechanics and a CCLA for orthodontic space closure can deliver predictable, high-quality treatment results. Finding adequate solutions for space management and occlusal adjustments in cases of isolated lower second premolar aplasia (ILSPA) is a frequently encountered challenge in clinical orthodontics, implantology and prosthodontics. The types of teeth affected by aplasia are most commonly second premolars, followed by maxillary lateral incisors and maxillary second premolars [1, 2]. In contrast to patients with multiple dental aplasia, patients with ILSPA and otherwise complete dentition, including third molars, may benefit more from orthodontic gap closure than opting for either prosthodontic solutions, auto-transplantation or implants [3, 4]. Third molars, which are often extracted in patients with complete dentition, may be used in this situation to compensate for excess space in the premolar aplasia region. Orthodontic space closure can be performed whilst the patient is a teenager without having to wait for growth to be completed, as required in implantological or prosthodontic treatment approaches [3, 4]. A choice between these treatment options requires that the orthodontist exercises diligence in informing the patient and / or his guardians. For underage patients, decisions are most often made by their guardians and the orthodontist, and it is worth mentioning that the chosen solution for restoring the edentulous space will affect the patient for a lifetime . While it has been widely regarded as favorable to treat cases of ILSPA in combination with maxillary counterbalancing premolar extraction, in order to achieve a proper molar and canine Angle-Class I occlusion in a convenient manner, concepts for ILSPA space management without maxillary counterbalancing extraction have been suggested as an alternative and valid treatment option [5–7]. Particularly in cases where there is no crowding in the upper arch or even with spacing, a counterbalancing extraction may not be considered appropriate. However, as a loss of canine anchorage may occur during space closure, this treatment approach is challenging: compromised occlusal results measured in terms of the absence of proper canine guidance during laterotrusive mandible movements, as well as midline shifts, may be a consequence of inadequate anchorage control and space closure mechanics [3, 8]. Therefore, good clinical practice suggests increasing anchorage during ILSPA space management by making use of inter-maxillary elastics, −telescopes, or - springs, if this is compatible with individual sagittal requirements, such as the presence of an Angle-Class I or II malocclusion . The aim of this study was to evaluate the effectiveness of Herbst telescope anchorage in combination with double-cable pull mechanics and a completely customized lingual appliance (CCLA) for orthodontic space closure in ILSPA. The quality of the occlusal outcome was determined by the deviation of the final canine occlusion from an Angle-Class-I and its consequences for overbite and overjet. 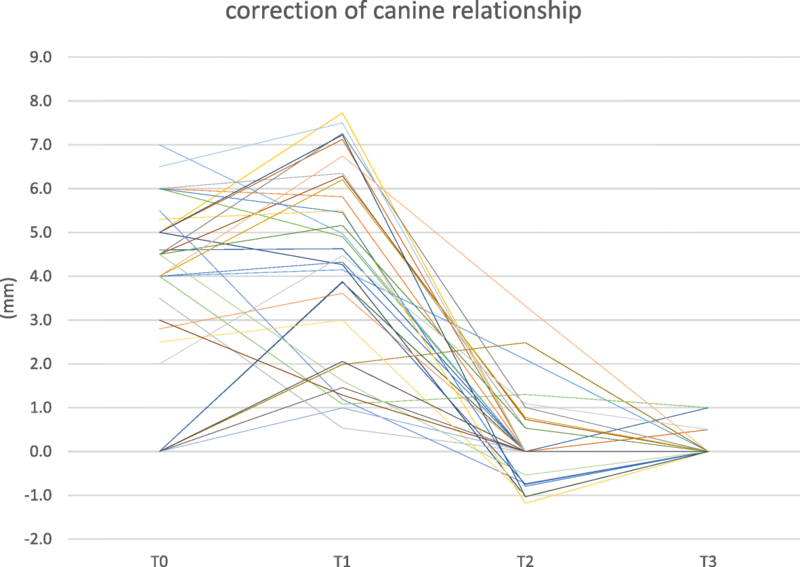 The null hypothesis was that there is a significant deterioration towards an Angle-Class II canine relationship following complete space closure using molar mesialization. This retrospective study received full approval from the ethics commission of the Hannover Medical School (MHH; # 7727_BO_K_2018) prior to the commencement of data collection. All patients who were treated with a CCLA (WIN; DW LingualSystems; Bad Essen, Germany) in one orthodontic center (Bad Essen, Germany) and de-bonded during the observational period from October 1st 2014 to February 28 2018 were consecutively screened for potential eligibility for this retrospective analysis. All treatment plans were approved by the same clinicians (DW, FB) prior to initiation of orthodontic treatment. (I-4) completed treatment with a completely customized lingual appliance (CCLA) in combination with a Herbst appliance. To minimise the risk of bias, no patient was excluded from this study for any other reason; in particular, bad compliance or missing records. This procedure was followed in order to evaluate not only the feasibility but, first and foremost, the predictability of the method. Of all CCLA treatments completed during the recruitment period (de-bonding between October 1st 2014 and February 28 2018), 123 patients (7%) were treated with a combination of a CCLA and a Herbst appliance. Twenty-five subjects with an age range of 12.3 to 20.6 years (mean age 15.0 years/ SD 1.7 years) at the beginning of fixed lingual orthodontic treatment were eligible for trial assessments. 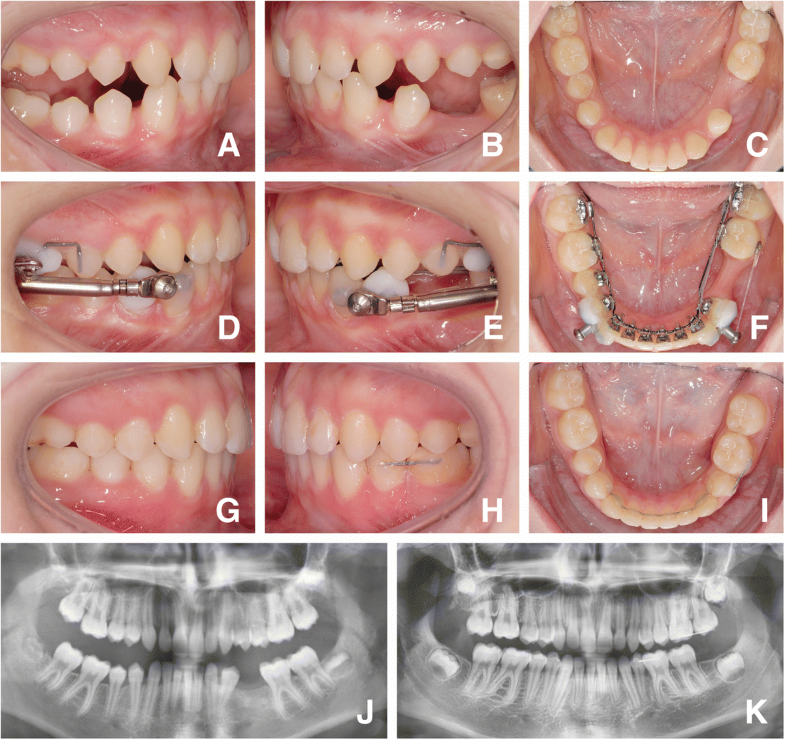 A total of 33 situations with lower premolar aplasia space closures (right / left sided 17 / 16) were assessed. Eight patients had a bilateral aplasia, with unilaterally missing second premolars apparent in 17 situations. Metric assessments were performed at the following time points: T0, immediately prior to bonding of the fixed lingual appliance; T1, initiation of anchorage reinforcement by adding Herbst telescopes; T2, completion of gap closure and removal of Herbst telescopes; T3, de-bonding of the fixed lingual appliance. The mean ages of the patients at the single treatment steps between T0 and T3 are given in Table 1. The treatment involved the use of a completely customized lingual appliance (WIN, DW LingualSystems, Bad Essen; Germany) in combination with a Herbst appliance (modified MiniScope, American Orthodontics, USA) for anchorage reinforcement . Second molar brackets were designed with occlusal pads to reduce antagonistic interference. Space closure was achieved by two power chains as a double-cable mechanic device (Morita Energy Chain, Rocky Mountain Orthodontics) attached both lingually from first premolar to second molar and labially from the Herbst attachment to a buccal cleat on the first molar (Fig. 1f). Initial load was set at 150 cN (1.5 N) per power chain, equal to about 300 cN per protraction mechanic. As the alveolar processus in the area of the gap was, in many cases, extremely thin, the goal was to protract especially the first molar in a slightly mesio-rotated position, in order to prevent a gingival recession on its mesial root. Herbst telescope activation was based on individual requirements in a step-wise manner. In addition to the standard retention protocol of placing a fixed 3–3 retainer, a labial fixed retainer was bonded from lower 4–6 at the de-bonding appointment, in order to prevent the aplasia space re-opening, and another one from upper 6–7, in order to prevent elongation of the upper second molar. In cases of pronounced Angle-class II canine relationship at the beginning of lingual treatment, an activator was prescribed for night-time wear, in order to support the retention of the anterior/posterior correction . Plaster casts routinely prepared at T0 and T3 were utilized to assess space closure, canine relationship, overjet, and overbite. Wax bites taken in the subject’s centric relation were used to correctly position upper and lower plaster casts. The plaster target set-up models were mounted in the articulator. Assessment of overjet and overbite was performed on plaster models using the maximal distances between the upper and lower incisor labial surface or the maximal vertical incisor overlap. The sagittal canine relationship was determined by assigning a value of zero (0) mm to a neutral (Angle-Class I) canine relationship, i. e., the cusp of the lower first premolar is in contact with the upper canine and the upper first premolar. Deviations from neutral sagittal canine occlusion in the posterior direction (i. e., distal or Angle-Class II occlusion) were taken using a sliding caliper (Dentaurum, Münchener Modell, Ispringen, Germany), and defined as positive distances (+ mm); conversely, deviations in the anterior direction (mesial or Angle-Class III occlusion) were defined as negative values (− mm). All metric assessments were performed manually by one operator (EK) using a sliding caliper. Measurements of the gaps between the first premolar and the first molar, as well as the canine and incisor relationships, were recorded and assessed at time points T1 and T2 using digital, high-resolution, intra-oral photographs (D200, with Nikkor 105 mm; Nikon, Tokyo, Japan). Space dimensions were measured on occlusal photographs perpendicular to the occlusal plane using dental mirrors with dimensions 10.5 × 7.5 cm. Photographs used for assessing the canine relationship, as well as the overbite and overjet, were taken directly (perpendicular to the canine’s labial surface, to avoid any potential errors by distortion), using cheek retractors (NOLA, Chicago, IL, USA), without using mirrors. In order to obtain the true dimensions of the assessed space magnitude, canines, and incisors on the digital photographs, a calibration technique which had been proposed previously was employed . The intraoral photographs were scaled to the corresponding plaster casts by adjusting the dimensions of the upper canine (for sagittal occlusion assessments in lateral view) or the lower first molar (for aplasia space dimension assessments in occlusal-view) and the incisors in the photograph to its corresponding dimensions taken from direct cast measurements. Deviations from neutral sagittal canine occlusion in the posterior direction (i. e., distal or Angle-Class II occlusion) were likewise taken using a sliding caliper. Axial root inclination or the absence of parallelism of the roots was evaluated using panoramic x-rays directly following de-bonding (T3). Root angulation of teeth located in a mesial or distal juxtaposition to the site of aplasia (lower first premolars and molars) were judged using the index for root parallelism of the American Board of Orthodontics (ABO; ) which distinguishes between roots that are parallel, non-parallel, or contacting. where d is the difference between the Measurements and n the number of assessments . The results of the method error analysis are given in Table 2. Measurement data were analyzed descriptively (mean, minimum, and maximum values with standard deviations). A comparison of dependent variables was carried out using the t-test. The significance level was set to α = 5%. SPSS Statistics V_25 software for Windows 10 was used for all statistical tests (IBM, Armonk, NY, USA). On completion of fixed lingual orthodontic treatment (T3), all second premolar aplasia spaces were completely closed, as planned in the target set-up, yielding a success rate of 100% (Table 3). With space closure and Angle-class II correction together, the molar relationship on the aplasia side was corrected on average by 10.9 mm. Following leveling and aligning (T1, Table 3), the mean aplasia space dimension was 6.5 mm. Overall duration of space closure produced a mean of 13.0 months (SD 5.5; min. / max. 3.6 / 25.7 months), equal to 0.57 mm per month (SD 0.26; min. / max. 0.11 / 1.35 mm). The differences between right and left sides were minimal (right-sided: 0.59 mm / months; SD 0.26; min. / max. 0.28 / 1.35 mm/ months; left-sided: 0.54 mm / months; SD 0.26; min. / max. 0.11 / 1.25 mm/ months). On the aplasia side, at T0 (Table 3) a pronounced tendency for having a distal occlusion was observed, with a mean deviation of 3.5 mm. At T1, i. e., following leveling and aligning, the mean extent of distal occlusion increased insignificantly (p-value 0.064) to 4.3 mm, and dropped significantly following Herbst appliance removal (T2) (p-value 0.001) to a mean of 0.2 mm (Fig. 2). In 29 of the 33 canine relationships assessed, an Angle-class I sagittal canine relationship (0 mm) was achieved at T3, with an overall correction of 97.5% compared to the individual treatment plan, the target set-up (Fig. 3). An improvement in distal occlusion compared to T0 was seen in all patients at T2. 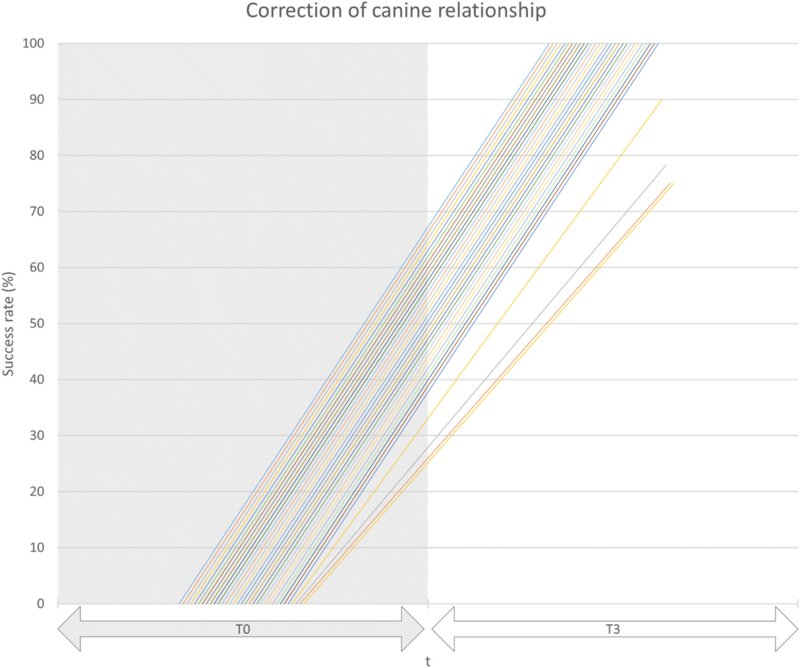 No significant changes in inter-canine relationships were noted between T2 and T3. At T0, the mean overjet was 4.0 mm (SD 1.6 mm) and increased highly significantly to a mean 5.1 mm (SD 2.3) following leveling and aligning (T1). It decreased highly significantly to a mean 0.9 mm (SD 0.5) following the Herbst telescope treatment stage, with some sagittal overcorrection (0.9 mm, Table 3, Fig. 4) to address potential relapse in those patients who initially had distal occlusion. At T3, mean overjet was 1.9 mm (SD 0.4 mm). 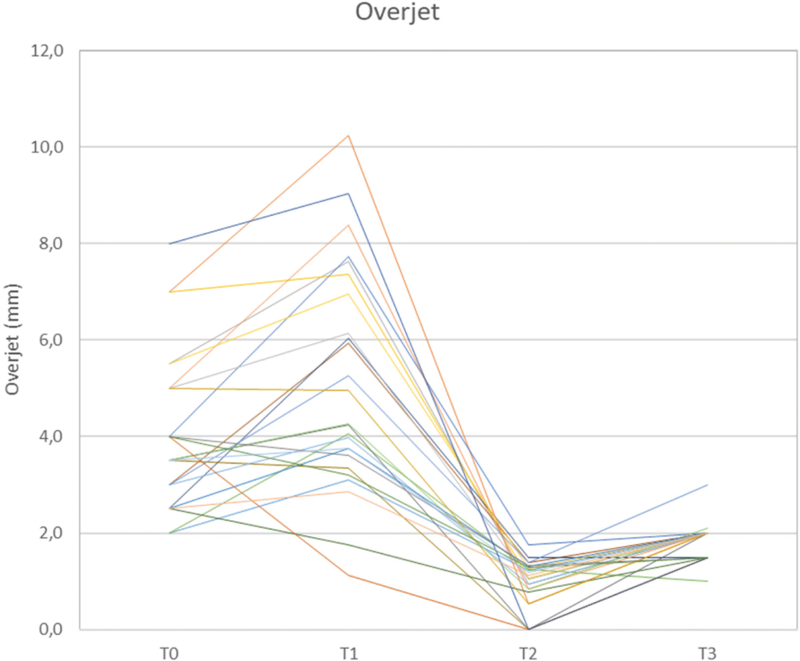 The mean overjet correction was 2.1 mm (93.9% of the planned movements). 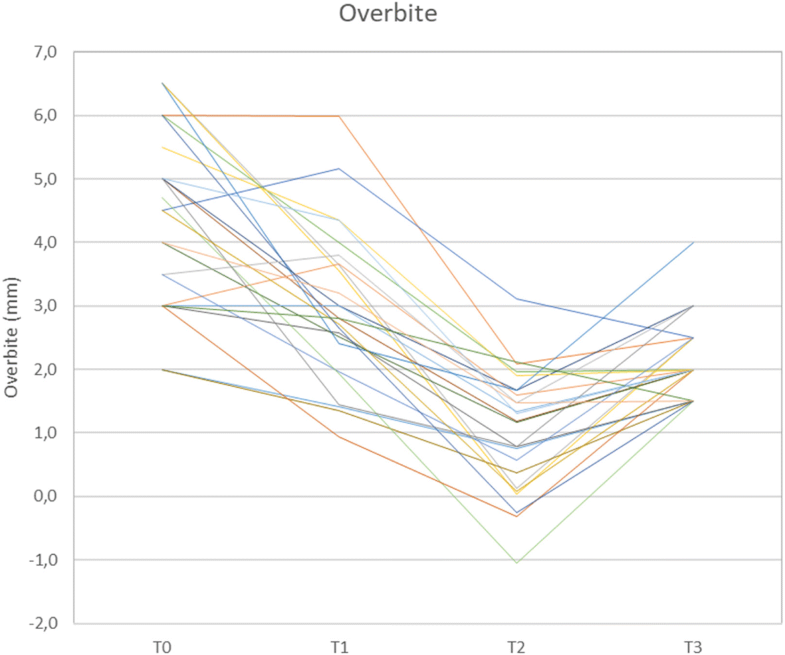 Initial mean overbite was 4.4 mm (SD: 1.4, Table 3, Fig. 5). In all 25 patients, correction of deep bite was achieved by a mean 2.3 mm (SD: 1.2; min. / max. 0.5 / 4.5 mm) representing 96.4% of the planned movements. There was a significant reduction in overbite during leveling and aligning (T1), with an additional reduction during Herbst treatment (T1-T2). Mean overbite at the end of treatment was 2.2 mm (SD 0.6). In 31 of 33 cases (93.9%), the roots of the lower first premolars and those of the first molars were parallel following aplasia space closure. The roots adjacent to two aplasia situations (6.1%) were not parallel at T3. However, contact between adjacent roots was not seen in any of the 33 cases. Total mean duration of treatment with the fixed lingual appliance (T0-T3) was 38.4 months (SD 7.6; min./max. 19.6 months; 52.4 months). Leveling and aligning (T0-T1) took a mean 12.0 months (SD 3.4; min./max. 7.6 / 21.9 months), while Herbst treatment (T1-T2) stage took a mean 13.8 months (SD 4.1; min./max. 3.6 / 21.6 months), with active aplasia space closure durations of 13.0 months. Further occlusal adjustments following space closure (T2-T3) took a mean 12.6 months (SD 5.0; min. / max. 4.6; 22.3 months). To the best of our knowledge, the present study is probably the first study to provide evidence regarding the rarely addressed subject of molar mesialisation using Herbst appliance anchorage in cases of lower aplasia gap closure without counterbalancing extractions. Clinical recommendations have been based on case reports [3, 8] and retrospective studies on a smaller number of patients, treated for 2.2–3.1 years, with push-and-pull mechanics [5, 7] or Jasper-Jumper . This study had a retrospective design. However, all patients who were de-bonded within the time frame of forty-one months prior to starting any assessments were screened for eligibility. In order to evaluate the predictability of the concept, no subject who met the inclusion criteria was excluded because of a lack of compliance, missing records, insufficient oral hygiene, or similar reasons. The reproducibility of the methods used here is judged to be adequate for assessing the occlusal changes in this study, as the variation in repeated plaster cast measurements varied between 0.16 and 0.35 mm, and for the photograph method between 0.3 and 0.53 mm (Table 2). The null hypothesis that there would be a significant deterioration in the inter-canine relationship towards an Angle-Class-II occlusion, in terms of a loss of anterior anchorage following space closure by molar mesialization, was rejected. There was not only no deterioration in the initial mean sagittal canine relationships (mean 3.5 mm deviation at T0), but instead a highly significant (p < 0.001) reduction to a mean 0.1 mm at T3 (Tables 3 and 4). Difficulties in achieving proper canine guidance in cases of ILSPA – mainly due to biomechanical requirements - have been described previously [3, 6]. Pure mesialization is desired in cases of ILSPA in combination with Angle-Class I occlusion, but reciprocal effects of common space closure mechanics contribute to a typical loss of anchorage and resulting midline shifts . Moreover, an Angle-Class II occlusion in combination with ILSPA elevates the treatment difficulty level clearly. Therefore, Herbst appliance or Jasper-Jumper anchorage has been proposed to limit the reciprocal effects of space closure on sagittal occlusion [6, 12]. This appears to be advantageous compared to mini-screw anchorage, not only in terms of space closure durations, but particularly in cases in which there is an existing Angle-class II occlusion . The mean speed of space closure was found to be 0.57 mm / month, which is slightly (12%) increased compared to those reported by Metzner et al. (0.51 mm / month) . This may be explained by this study having utilized a Herbst telescope system (WIN appliance, DW Lingualsystems, Bad Essen, Germany) which is less susceptible to appliance fractures or failures  than the appliance of the type used by Metzner et al. (Incognito appliance, 3 M Top Service für Lingualtechnik, Bad Essen, Germany) [12, 15]: When using a Herbst appliance or a Jasper-Jumper as anchorage during molar mesialisation, it is crucial to keep the rate of appliance fractures low, in order to achieve reduced treatment duration by a continuous space closure strictly from a posterior direction, without anchorage or interruption of fixed treatment. The Herbst appliance in combination with the CCLA used here is considered to be suitable for this purpose, based on previous research outcomes . The telescopes of the Herbst appliance are not directly connected to the lingual appliance, thereby avoiding arch-wire fractures which would otherwise produce additional repair appointments. Successful overjet reduction with a satisfying sagittal inter-incisal relation was accomplished in 24 of 25 patients. Reductions in overjet by Herbst therapy has been reported to vary from 3.1 to 6.9 mm. However, the purpose of these studies was to achieve sagittal mandibular enhancement and they were based on samples with larger initial overjets [16–18]. In our study, the Herbst telescopes were used primarily for anchorage reinforcement and, because of the inclusion of patients with initially neutral occlusion, the sample taken may have had less pronounced overjets compared to studies on the subject of Angle-Class II-correction effectiveness. Deep overbite has been reported to be commonly associated with aplasia [19, 20]. Deep overbite corrections in this study were observed to have a mean of 2.3 mm (min. / max. 0.5 / 4.5 mm; SD 1.2), which is in line with previous reports on Herbst appliance therapy [21, 22]. With the exception of two patients who had a normal overbite by the start of treatment, overbite reduction was finally achieved in all 23 other patients. At T3, three patients had a slightly increased overbite, as a trend, with overbites of 3 or 4 mm, respectively. Although the initial overbite of the latter was, with a value of 6.5 mm, distinctively more pronounced compared to the mean initial overbite of the sample (Table 3), inadequate deep bite correction may be attributed to a lack of proper upper and lower incisor third order control and underlines the need for choosing arch-wires with adequate dimensions or third order overcorrections in cases of ILSPA. Parallelism of the roots of the first molar and those of the first premolar following gap closure was observed in 31 out of 33 situations. In two situations a mesial angulation of the premolar roots was observed and this is most likely due to using elastic chains with an under-dimensioned, incompletely slot filling 0.016 × 0.024 “steel arch-wire (slot dimensions: 0.018 x 0.025”), with some proportion of a vertical bowing effect. Bracket slots with larger mesio-distal dimensions may reduce this problem. Despite the existence of several reports on the orthodontic treatment of ILSPA, information about treatment duration is scarce [5–7]. Zimmer and Rottwinkel  reported a duration of mean active ILSPA space closure treatment of 3.1 years (37 months)(min. / max. 2.4 / 3.1 months), which is similar to our results, although the extent of molar mesialisation during orthodontic space closure reported by those authors was smaller than in our patients. Orthodontic treatment duration in those cases of ILSPA assessed by this study had a mean of 39.3 months, thereby distinctly exceeding average treatment durations of conventionally / labially bonded orthodontic cases without the need for space closure by congenitally missing teeth (20.02 mo; ). Levelling and aligning required a mean 12.0 months in the actual study cases. However, we observed a decrease in average treatment duration with increasing experience collected while treating the first patients of this study. The experience of the clinician seems to have an influence and Fig. 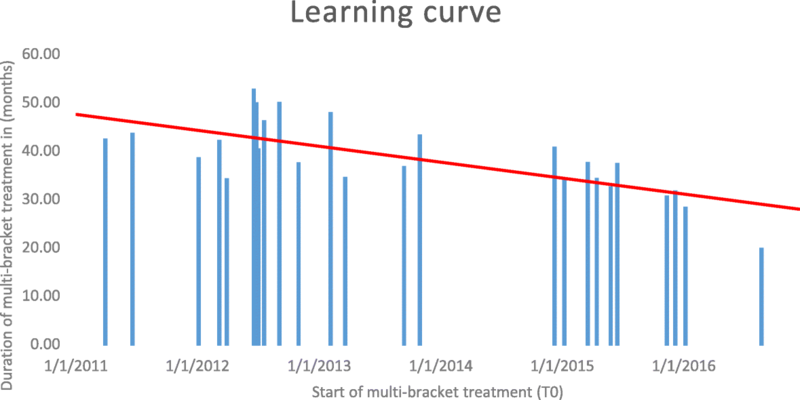 6 provides some evidence of the effect of an increasing training curve, reflected in a manifest reduction in mean treatment times of patients bonded later during the observation time frame. Based on the experiences gained whilst treating these patients, it is advisable to use elastic chains between lower first premolars early in treatment, in order to reduce the time until incorporation of the Herbst telescopes. Also, the use of steel ligatures early in treatment is considered to be helpful in angulation control of lower canines and may indeed speed up treatment. ILSPA gap management can be addressed by a variety of diverse treatment approaches, each of which having both advantages and disadvantages . Potential treatment options mostly involve abundant mesio-distal enamel reduction of deciduous second molars, in order to prepare these teeth for a premolar-shaped crown. The disadvantages of this approach may be the risk of damaging the pulp during reduction and the questionable long-term prognosis for milk molars with distinctively shorter roots [3, 24]. On the other hand, this approach provides a much quicker solution than orthodontic space closure. Other viable treatment options include the use of bridges, implants, or auto-transplants [3, 25]. A success rate of auto-transplanted third molars to replace premolars has been reported to be 85% after 3.3 years, but also requires subsequent orthodontic treatment to prevent increased failure rates due to persistent infra-occlusion and ankylosis [25, 26], which are also the typical problems maintained primary molars . The advantage of protracting molars into edentolous areas would be a much better long-term prognosis and, in the case of the presence of third molars, the opportunity to close the gap without using material that may require renewal at some point in the future. One should bear in mind that ILSPA patients presenting to orthodontists are mostly under-aged and unable to fully evaluate the consequences of the various treatment options. The method proposed by this study offers a sustainable solution for replacing deciduous molars without utilizing extraneous material whilst preserving third molars , and also provides for adequate control of typical side-effects, such as anchorage loss or incomplete space closure. Space closure was achieved in all cases. Loss of anchorage during space closure is clinically well controllable, as Herbst anchorage seems to compensate distalizing forces of the double-cable mechanic, thereby providing the basis for adjusting an adequate inter-canine relationship in accordance with the Angle-Class-I occlusion concept. The proposed technique is therefore considered to be a clinically viable treatment option for ILSPA gap management. The experience level of the clinician appears to have an influence on treatment duration. The authors would like to thank Sabine Ruf and Hans Pancherz for their re-introduction of Herbst appliance treatment to the orthodontic community and their fundamental evaluation of this important scientific concept. The project did not receive any funding. All data and materials are available upon request at the following address: Private practice Prof. Dr. Wiechmann & Dr. Beyling & Kollegen; Lindenstraße 44, 49,152 Bad Essen, Germany. EK and DW initiated the investigation. EK, MK and DW designed the study. FB, EK and DW supervised the treatment and treated the patients. EK collected and analysed the data and wrote the manuscript. MK and DW revised the manuscript. All authors read and approved the final manuscript. This retrospective study received full approval from the ethics commission of Hannover Medical School (MHH; # 7727_BO_K_2018) prior to the commencement of data collection. All patients signed a written consent form. DW is the inventor of the completely customized lingual appliance WIN and owner of the DW LingualSystems, Bad Essen, Germany. All other authors don’t have any competing interests.